Was Shakespeare Stoned When He Wrote His Plays? 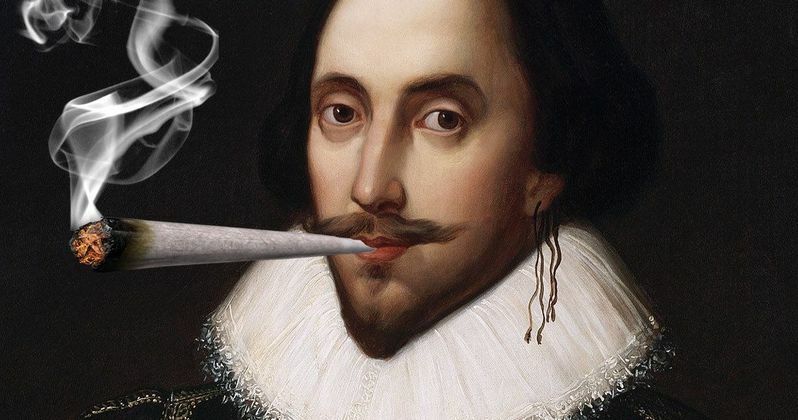 Was William Shakespeare a big stoner? That's the question being asked today. The idea that the legendary playwright, who is just as prolific now as he was back in the 1600's, liked to smoke weed has been circulating around the Internet for years. But now there is new evidence that helps back up this theory. And it's very likely that the man behind Macbeth and King Lear liked to get high while working. EW reports that scientists now have new psychical evidence to work with in figuring out just how much cannabis consumption William Shakespeare liked to partake in. Clay pipes were unearthed from the garden at Shakespeare's house in Stratford-upon-Avon back in 2001. At the time, South African forensic scientists tested the pipes, and found traces of marijuana. But the findings were quickly dismissed by Shakespeare scholars. In the 14 years since that time though, advances in technology have given scientists a new outlook. Forensic technology has advanced considerably in the decade and a half since the pipes were first discovered and tested. Scientists now say there is no doubt about the traces of cannabis found in William Shakespeare's old pipes. Now, the question of whether or not he was actually the one puffing on said pipes? That has yet to be answered, which means the debate will continue. There is no evidence that he was using the pipes himself, and this old weed residue could possibly belong to anyone. Researchers have tried to further their study on the pipes by searching for any and all references to marijuana in William Shakespeare's vast body of work. As luck would have it, Sonnet 76 does contain the word 'weed'. But is it the proof we need to conclusively declare the Bard of Avon the descendant of Jeff Spicoli, Seth Rogen and Silent Bob? Maybe not. Sonnet 76 features a narrator who seems to be experiencing writer's block. He is tempted by the 'invention in a noted weed'. Though, it is hard to tell sometimes exactly what William Shakespeare is hinting at in his works, and various lines of dialogue have been debated for centuries. The meaning behind the word 'weed' was different in the 1600s. And William Shakespeare was a lover of the double-entendre. Though scientists have proved that cannabis was smoked in pipes found in William Shakespeare's garden Stratford-upon-Avon, it is simply impossible to arrive at a confirmed conclusion. Perhaps we'll never know if the Bard was a stoner. And there are arguments on both sides of the fence. It's still a fifty-fifty chance that the man liked to get high while he worked. What side of this debate are you on?